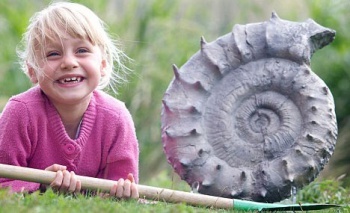 5-year-old Emily Baldry discovered a rare, 160-million-year-old fossil during a recent day at the beach. What have you done lately? Baldry, one of the UK's legion of adorable tow-head ragamuffins, found herself digging through the sand of Gloucestershire's Cotswold Water Park recently when she stumbled upon an immense, fossilized Rieneckia odysseus. If your familiarity with Latin naming schemes is a bit rusty, imagine a giant nautilus shell covered in spikes, like some kind of death metal cephalopod. Baldry, being as generous as she is precocious, opted to turn the giant, formerly living rock over to geologist Neville Hollingworth. According to Hollingworth, this find is "the first ammonite of this kind to be discovered whole in Britain. The rest have all been fragments." I would just like to take a moment to point out that Baldry did all this with a four-foot-long sand shovel. A children's toy. The kind you likely used as a kid to build sand castles and fling globs of wet mud at your siblings. Not to disparage Baldry's mud-flinging abilities, but this young lady used that same equipment to discover the remains of a creature that hasn't been seen on Earth since dinosaurs were flinging mud at their siblings. Endless congratulations to Young Emily, but one wonders how Dr. Hollingworth and his colleagues are taking this. Sure, he puts on a brave face in front of the cameras, and is quick with a kind word for the wee lass, but you have to imagine that this is just killing every adult who has dedicated his or her professional life to the science of paleontology. How do you top a 5-year-old who stumbled upon the most complete ammonite fossil in the history of the UK? Until John Hammond builds that park of his, Emily Baldry is the new queen of dino bones.